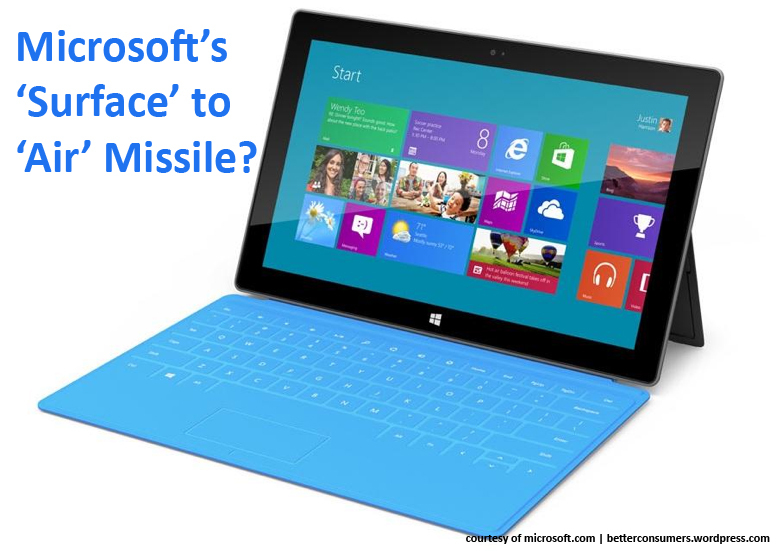 Microsoft Ultrabook: A ‘Surface’ to ‘Air’ Missile? Microsoft unveiled its new product that is part tablet-part laptop that critics call is actually more of an Ultrabook than a tablet. The 10-inch variety from Microsoft features a very intriguing look. One catch and you get hooked. Interested, I researched what this product could do and found out a several sleek things it can do. First, it’s an Ultrabook, which is far more thinner than your usual laptop. It depletes power lower so you can use it in longer hours. It runs on Windows 8 PRO, an operating system that features a whole new interface system that can give other operating systems a run for its money. The screen is Full High-Definition (HD), which gives viewing a more vibrant, colorful experience. Second, you can detach the colorful keyboard accessory and turn your laptop into a tablet-PC. The reviews I read said you wouldn’t have to worry about transforming your MS Surface gadget into a tablet because it works fast and intelligent. The last and awesome thing Microsoft Surface could do is to make all your Windows-running App (software) “runnable” without buying a new license. For example: If you bought an Adobe Creative Suite package on a PC, you can install and use the same application on this new device without violating any piracy laws! Isn’t that amazing? Windows has about 4 Million apps ready at its disposable giving Android app developers more problems. It is by far the most compelling thing PC users (and former PC users) can enjoy when they get their hands on to this new gadget. Unfortunately, this new ‘candy’ is not available in the market yet. It will release, according to sites I read, in the fourth quarter of this year. Would it be in time for Christmas? You bet. It’s the most sensible thing Microsoft aims to do. And it will give Apple’s MacBook Air quite a challenge considering that this new computer model is creating a sizable buzz and it continues to build so much that Apple may not like the sting of Microsoft’s bee. Microsoft is not just going to the bank laughing but I dare say that it could be the weapon that could dent – if not ‘kill’ – MacBook’s Air model if they don’t shape up and develop something more to wrestle the consumer’s Christmas budget. The Surface is definitely new in the market and it boast a lot of weaponry that leads me to say it could potentially be the ‘Surface’ to ‘Air’ Missile Apple doesn’t want to see burn their product goodbye.